Violence is certain, every action of every dem is proof positive of this certainty. I've been anticipating that, at some point, some ex-Marine is going to climb to the top of some Clock Tower over-looking a large gathering of Antifa fascists and show them what a real terror campaign looks like. In fact...I'm shocked that it hasn't happened already. As far as a large scale "separation", I don't see that happening in our lifetime. The better course in the short term is to surround yourself with like-minded folks in a state that respects individual liberty as guaranteed in the U.S. Constitution. Texas, for example. I believe that's where I'm headed next year when I retire. That map is fooked up. 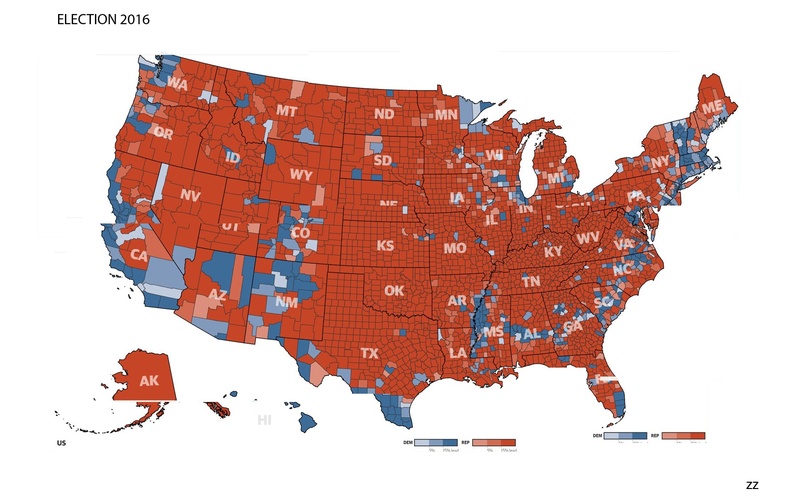 No way in hell my county is blue and the rest of the state red. Looked at a close up, maybe, mistook mine for Mercer Cty. Is that IL state property sales 'exit' tax in place? How much? Ever state has pockets of red to look at. I think I found what I wanted here in N.C.
(Cagney voice) "Not gonna catch me, coppa!" I don't think that it has passed the legislature yet....but..It's really difficult to keep up with the Left Wing antics of Illinois politics. They were proposing a 10% "Exit Tax". Imagine....they intend to literally steal 10% of your homestead wealth just so you can get the hell out of this place. It's like an invisible Berlin Wall. I already pay a little over $500.00 per month in property taxes...and I have a tiny 3 bedroom house. In the City of Chicago, the same size house would be paying $1000.00 per month in property taxes, right now! And they want to raise it higher still! It's all because the State Pension Fund is dead, flat broke. Believe it or not, it is expressly forbidden within the Illinois Constitution to reduce the Pensions and Benefits paid to current and former government employees. And their numbers are LEGION! And..it's not like the government employees are hurting for wages and benefits, either. Our garbage collectors here in my town are making $90,000.00 per year in wages. Many doctors don't clear that much! Chicago has City bus drivers pulling down $140,000.00 per year. It's insane! So...now they need a way to discourage people from leaving so that they can continue to force you to feed the gaping maul of government excess! Sounds like a cold Venezuela. And they are all waiting for a pension. Same thing in NJ; property taxes are outta sight, and there is an exit tax. We paid it on Gunsmith's share of his mother's house in order to take the money out of State, I just don't remember the %. I recall there was some attempt to reduce pensions but the IL Supreme Court pointed out the change to the constitution years back. It wasn't judicial activism, they didn't want to get blamed for it. I imagine a constitutional change could undue it but ... all that infighting. My brother lives in IL still. If they do pass the exit tax I can imagine all the fire sales before it takes effect. Lots of poor fixed income folks are getting starved out by property taxes. Decades ago I lived in Arlington Heights, Mt Prospect, Oak Forest and Riverdale. All that is 3 years. Long story. I lived for a year in Riverdale before it "changed."